Larry Bowman was lost on the 1st day of a 3 day contact. We were inserted into the field in the rain at last light. We set up without sending out clearing patrols. I don't even think we put out trips. At first light either 2-6 or 3-6 was sent out. We had setup right next to a bunker complex, they opened up. For the next 2 days we fought to a stand still. On the 3rd day 1-6 had the point. As we moved further and further into the complex we realized they had left. It was that day we recovered Bowman's' body. A couple of things I remember pretty well. Both troopers that died during the firefight of June 19-21 died on the same day. 2nd platoon 'volunteered' to go and help extract the squad that was pinned down. We could only bring back one KIA. The next two days were spent to retrieve the second KIA. I never knew their names. Michael Schexnider I remember to be correct about Larry Bowman's and Robert Steele's death, I was the lead point man of the 2nd platoon that volunteered to get those troops that were pinned down and to bring them a medic, as our medic stepped just past me taking his hands off my shoulder he too was hit by AK 47 rounds. The fire fight was so intense that we could not get the second KIA, I could see that he was dead. 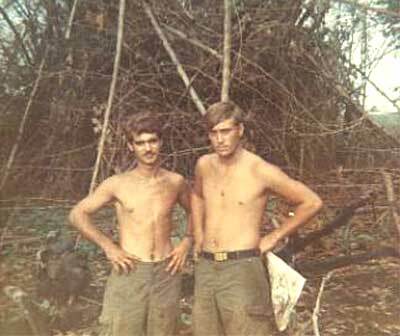 The next day I was the lead point man in because we knew the way, I could almost touch the body but the enemy opened up on us again with AK between the to trees and direct sniper fire, I think "Shep" got the sniper with several volleys of grenades, still we could not reach the body. On the third day I lead point in again this time we really knew the lay of land and saw the enemy first and I shot one running bare foot down, through the under brush, but the enemy fire was still to great to get the body. We moved back further that night to bring artillery in closer, the guys may remember that we heard a tank that night and not ours. The Forth day another platoon volunteered too go in first, the enemy was gone, tank tracks were on the ground, and the body of our comrade was almost on top of the bunker. 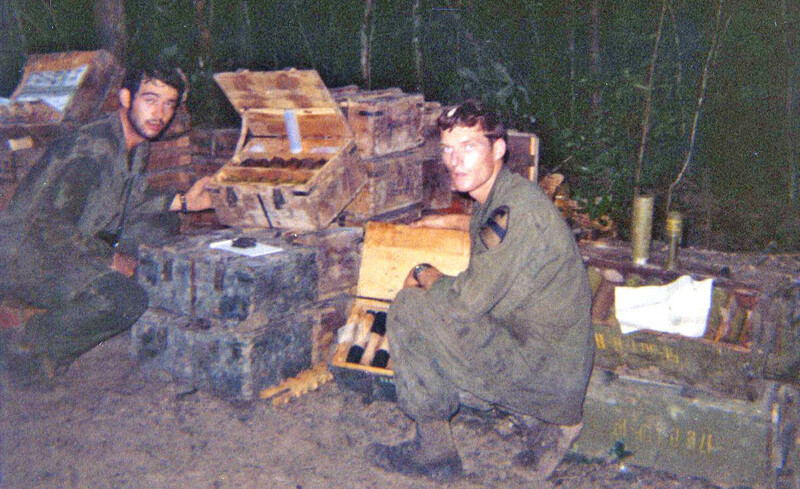 We found a large enemy supply of food and ammo, spent a few days air lifting the 7.62x39mm out and blowing the rest, and was that one big explosion. 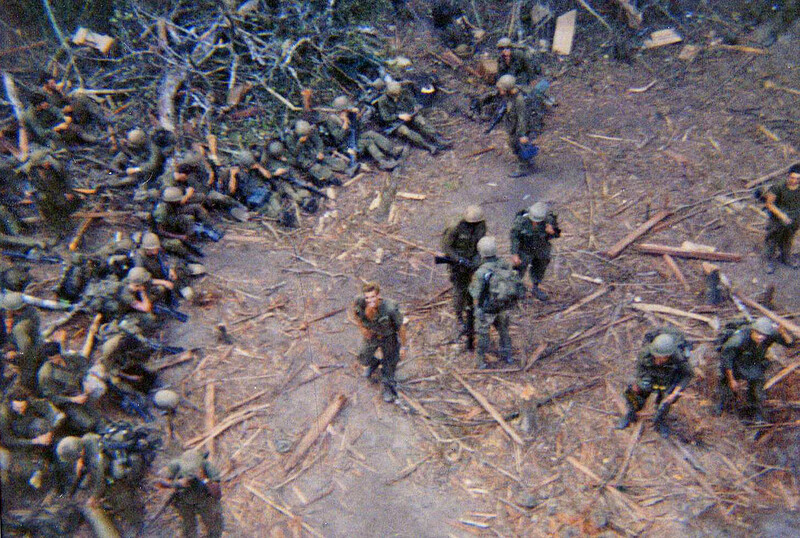 We then moved a few kilometers to link up with another company who had also found a very large enemy supply dump, stayed the night, the next day Hueys lifted all those men one or two helicopters at a time. I'm 53 now but I still remember the Australian band at "stand down", and getting one of the finest officers in the army, CPT. 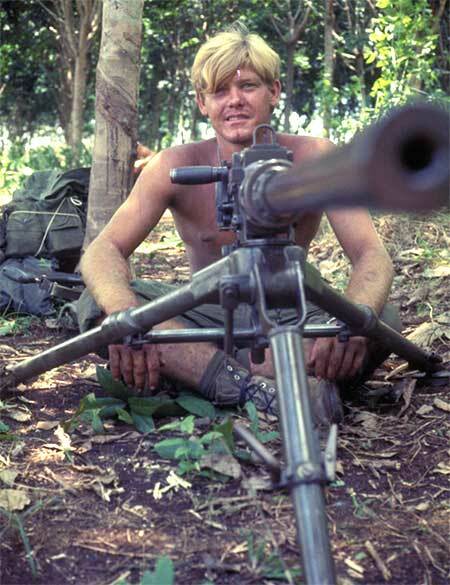 Joseph Anderson, but was concerned loosing LT. Brace who let me slide when I deserved punishment after almost blowing my friend Duffey away linking two belts of .50 cal. rounds of tracers back to back together. I believe that Bowman and Steele died around the 9th & 10th. Steele died in my arms. Bowman was hit in the first burst and went down. The medic from second platoon was hit that day. I was 6 Band aid at the time but the 2nd was my platoon. I attempted to get to Bowman but was pinned down for several hours almost close enough to reach out and touch his boot but I could get no further. The battle on June 19-21 was because we would not back off and leave Larry's body. I myself had to be rescued from that spot. 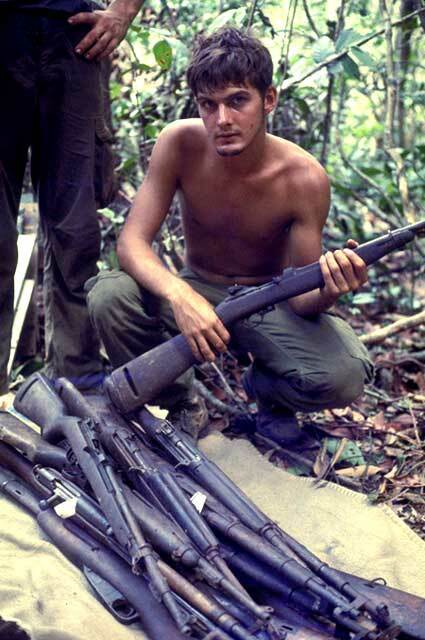 A guy named (I think) Montoya crawled out with an M-60 and saved me. Steele was hit by a sniper. He took one round in his forehead just below the rim of the helmet. (Webmaster note: At present, there is considerable conflict as to the dates of this and other actions in June. 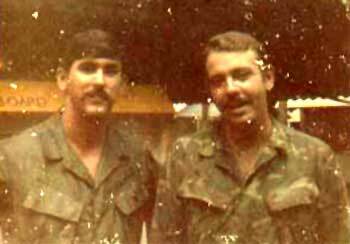 The date of Larry Bowman's and Robert Steele's death are listed as June 9 and 10, yet Nick Gallo remembers their death's occurring during the same time period for which he was awarded the Army Commendation Medal for Heroism. Bob Brace says he remembers his relinquishing command of the company during the first week of June, immediately after returning to Quan Loi. 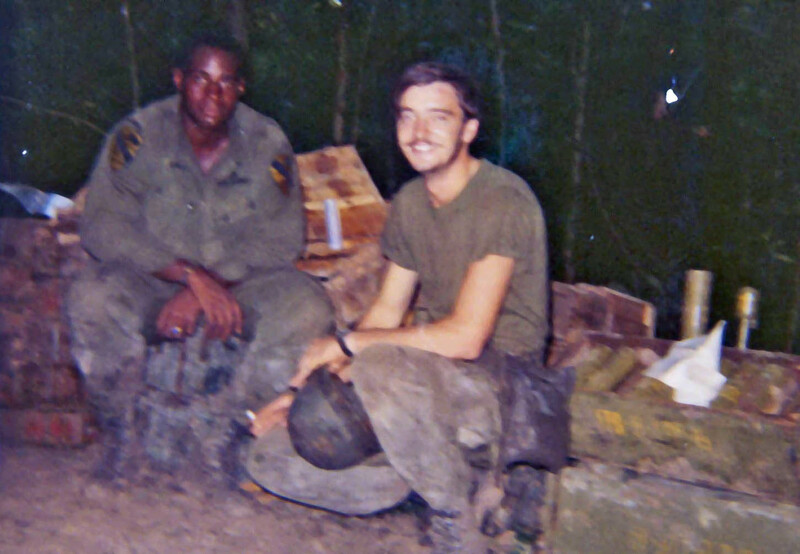 In a recent email from James “Doc” Thom, who was a medic with Charlie Company during the Cambodian incursion, Doc shared this recollection of meeting CPT Joe Anderson, the incoming company commander, for the first time. When we came out of Cambodia, we were pretty wasted. They gave us a part of the green line at Quan Loi. It was kind of funny because nobody was breakin balls. They left us to ourselves. Steve Wright and I took a walk to a PX someplace and bought a bottle of Bacardi. (It was the only stuff they had!) We spent the day building a cooler out of ammo crates and insulating it with the Styrofoam used to pack mortar shells. Then he went into some song and dance about me not challenging him as he entered. By then I had figgured out that he wasn’t there looking for a cold beer! He kept it up. I'll be honest. I was not ready to listen to that crap then. So I stood up then and the pistol was right there. I think the 2 MPs dropped a few loads in their pants. Then Bob Brace came in. He took one look and had a big smile on his face as he looked at me. He then introduced me to my new CO. Man what a way to start a relationship! He said to me the day Bowman was hit "Doc, this company isn’t giving an inch until I get the kid back” I nodded. I figured I could get out there get the kid and drag him back easy enough. Then he gave me a direct order! "Don’t you dare try to reach that kid until I can extend the arc out further." I should have listened but I can be thick at times and tried anyway. Then he had to send a guy out to get me. I was out there for a long time. (I tried to cut of the buttons of my shirt to get a little lower but that didn’t work.) I didn’t ever hear anything from him about it though. It took 2 more days to get Larry’s body, but Joe was true to his word. We never gave an inch! That was my last battle. Several days later he blew out a small clearing to get a chopper in to take me out when my Old man had the heart attack that finally killed him! As the bird was rising, Joe came to attention and snapped off a salute to me! I couldn’t stand up because I was sitting in the doorway, but for probably the only time in my Army career I saluted an officer back and really meant it! Joe Anderson was a class act all the way! 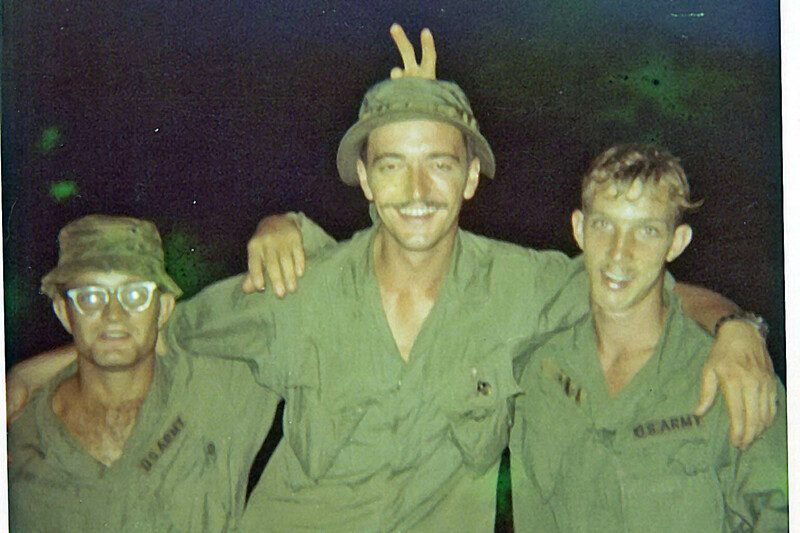 After the change of command, Charlie Company joined the rest of the battalion in a stand-down at Bien Hoa. Howard "Doc" Hager, Tim Dube, and Ralph Duffy enjoyed themselves. Notice the 5th Cavalry crests on their shirts. 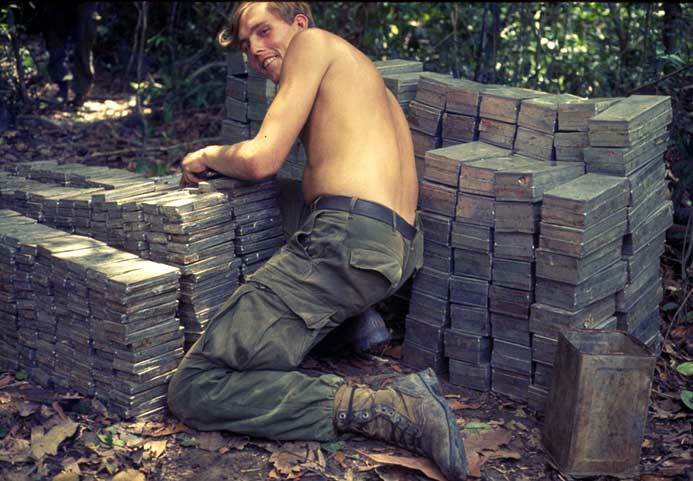 The purpose of the Cambodian incursion was to disrupt the enemy's extensive supply bases in heretofore safe Cambodia. Certainly 1st Platoon did their part, showing off some of the captured equipment and weapons. Anyone knowing the name of the trooper with the SKS rifles, please inform the webmaster. Click on these photos to see larger version. 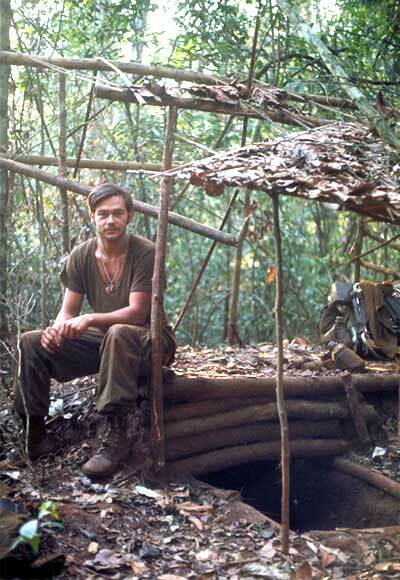 Nick Gallo, somewhere on a firebase in Cambodia. 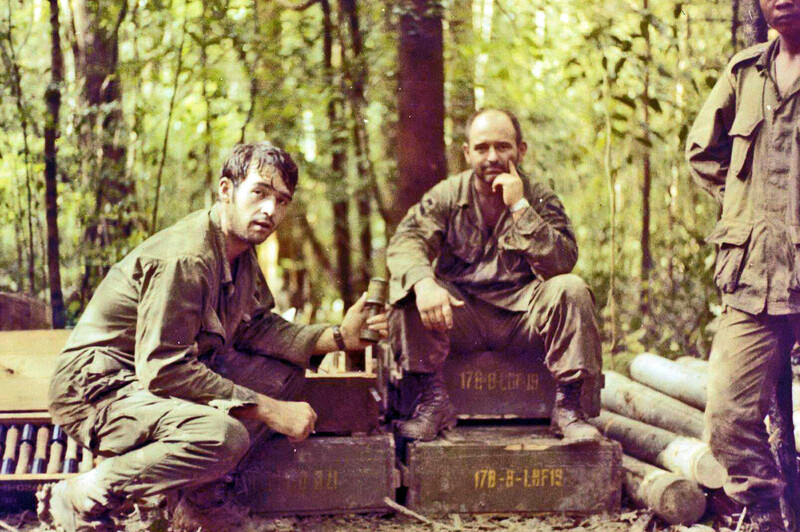 SP4 Eddie Hancock and 1LT David Petruska, Quan Loi base camp. LT Petruska went on to command A Company, 2/5 Cav from June 30 to July 15. 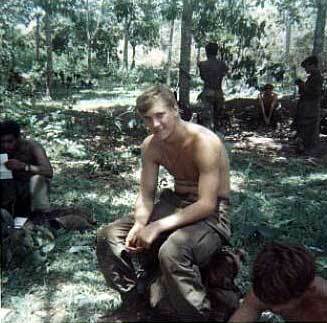 PFC Robert "Indian" Lisenby came in country in June, and is shown here at the First Team Academy in Bien Hoa. 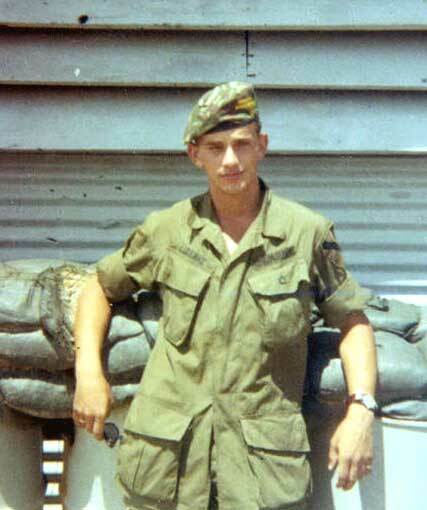 In this photo, he has nice clean new fatigues and a fancy beret with a Cav patch and "C 2/5 Cav" embroidered on it. Bought it from Mama San. 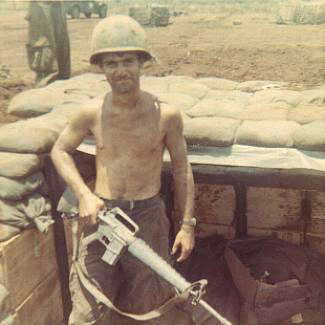 From Bien Hoa he went to to the 1st Cav Division's forward base at Phuoc Vinh, then to Quan Loi, then out to the weeds at LZ X-Ray in Cambodia - filling sand bags.